Shetland Starling on Fair Isle. 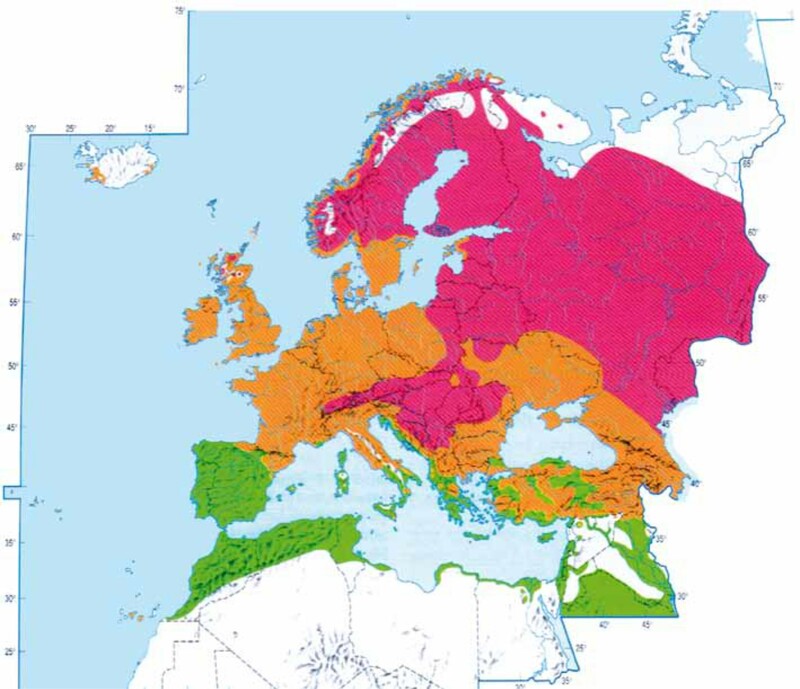 The European range of the Starling (Sturnus vulgaris). Areas in red refer to the breeding distribution of birds that undertake seasonal migrations, brown shows resident breeding, and green indicates winter distribution (from Snow & Perrins, 1998). 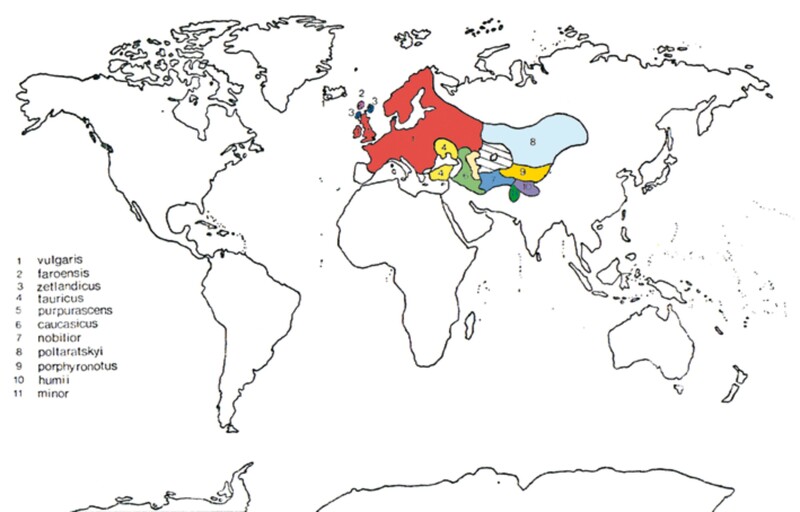 Distributions of the different races of starling in Eurasia (Evans, 1980). Distribution of Starling nests between 1980 & 2010 in relation to habitat. Red circles denote nests. 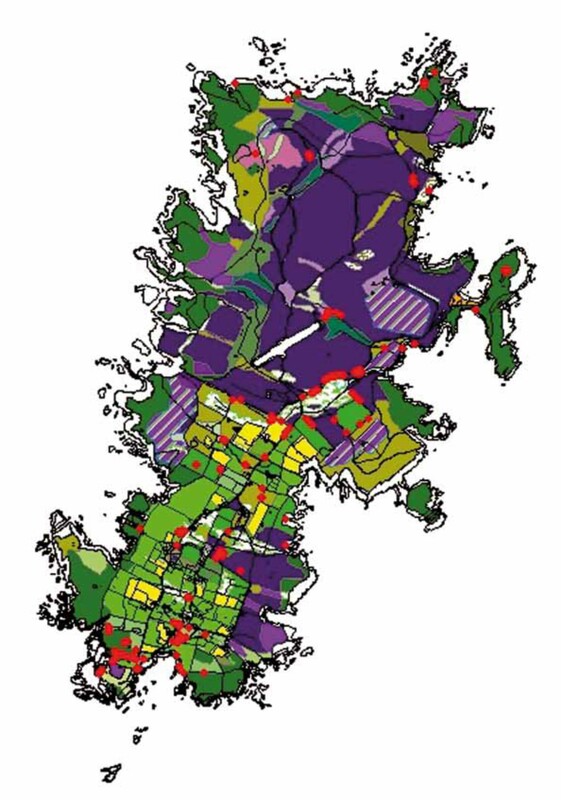 purple areas = heathland dark green = coastal grassland light green = improved pasture yellow = arable (courtesy of Nick Riddiford & Daisy Brickhill). Juvenile Shetland Starling on Fair Isle. 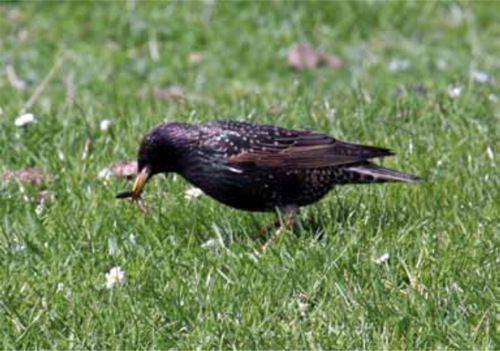 One of Fair Isle’s most familiar birds is the Starling. On an early June day, a walk from the Bird Observatory down to the south of the island is likely to be accompanied throughout by the screams of hungry Starling chicks deep within the walls along the roadside. Since 1980, this isolated island population has formed a long-term study. Every spring, the breeding biology of between 50 and 100 pairs, distributed across the interior of the island, is investigated: adults and young are ringed, laying dates and clutch sizes determined, and the fortunes of eggs laid and young hatched are followed through their lives. The Starling is one of our most widely distributed birds, occurring naturally throughout Europe & western Asia. Over most of its European range, it shows little variation in morphology, but on particular Atlantic islands two separate races occur: Sturnus vulgaris faroensis in the Faroe Islands and S. v. zetlandicus in Shetland, Fair Isle, & the Outer Hebrides. This latter race may form a relict population that until the 19th century was widespread throughout Scotland. The island race S. v. zetlandicus is most obviously distinguished by the sooty brown plumage of the juveniles, but it is also larger with a longer wing. At just 12 days old, a nestling on Fair Isle will typically weigh the same as an adult Starling from southern England. Since the early 1980s, Starling numbers have declined markedly in many parts of UK, as well as much of northern Europe, mainly as a result of reduced survival of juveniles (from 33% to 15%). The reason for the decline is not known for certain but possible causes include changes in farming methods (with cattle increasingly kept indoors, particularly in winter), reduced nest site availability in buildings, and widespread use of chemicals. With a two-thirds reduction since the 1970s, the Starling in Britain has become ‘Red’ listed for conservation concern. Starlings do not nest everywhere on Fair Isle. They favour sheltered sites at the base of stone walls or within rock piles, and often line their nests with sheep’s wool in order to protect their young from the cold winds that may sweep across the Isle even in June. Many of the nest sites on Fair Isle have been occupied repeatedly over the 30 years of this study, with pairs returning year after year to the same site. After fledging, young birds roam the neighbourhood of their nests in family groups, before joining juvenile flocks and dispersing over a wider area prior to migration. By late summer, the majority have migrated from the island, some flying north to Shetland but most southwards to Orkney and the Scottish mainland. After 1-2 years, surviving juveniles return to the Isle, frequently breeding in the vicinity of where they were born, and some even occupying the same nest. Males tend to breed a year later than females, but thereafter apparently remain on the island until they die, which can be as much as 12 years of age. 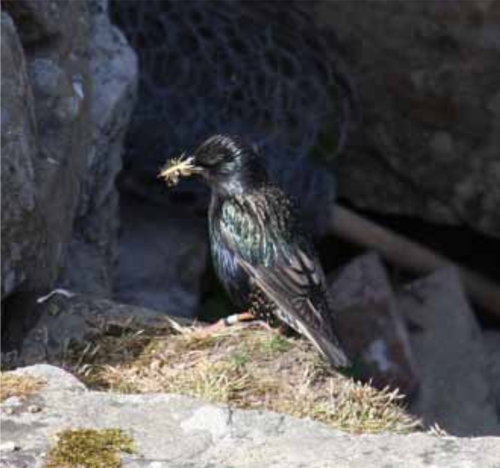 In order to track the trends in the Fair Isle Starling population, individual nests are followed through each season. 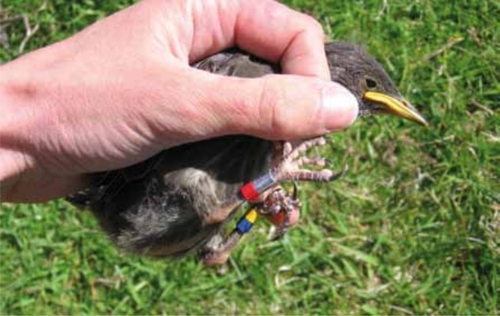 When the young are 12 days old, they are given a numbered metal BTO ring and a colour ring on one leg and two colour rings on the other to form a unique combination so that an individual can be identified in the field. Unlike most of the rest of Europe, the Starling population of Fair Isle has actually increased slightly over the last 30 years. Starlings on Fair Isle show very marked breeding synchrony, with 80% of females laying within 2-3 days of one another across the island in any one year. Four to five eggs (occasionally up to seven) are laid, usually between 6th and 8th May, but the most common lay date in any year can vary from the end of April to the middle of May, as well as varying between areas within a year. Generally, some 85-95% of eggs hatch after a period of 13-17 days from the date of first egg laid. The chicks grow fast on a diet of mainly tipulids (cranefly larvae), and on average 3-4 young fledge after 18-22 days. In some years, a few pairs will have second broods, but the fledging success of these tends to be very low. 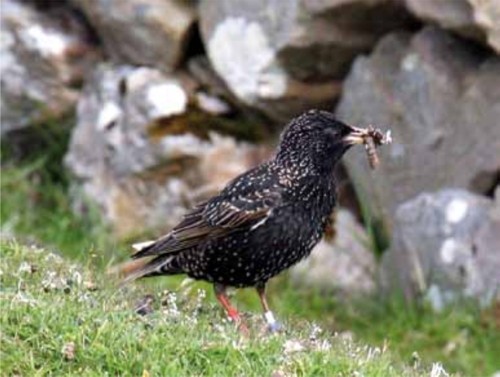 Following a UK-wide trend, the average clutch size of Fair Isle Starlings has increased by around 5% over the last 30 years, from 4.5 (1980-84) to 4.7 (2005-09), but unlike the UK mainland, laying dates have advanced only very slightly in that time, whilst breeding success has remained at c. 70%. Author: Dr P.G.H. Evans, 2011. Graphics reproduced from Snow, D.W. & Perrins, C.M. (1998) The Birds of the Western Palearctic; Evans, P.G.H. (1980) Population Genetics of the European Starling. DPhil Thesis, University of Oxford; British Trust for Ornithology Breeding Bird Survey; I would like to acknowledge the support over the years of all the wardens and staff of the Bird Observatory, and particularly to Drs Jane Reid, Juliet Vickery, Jeroen Minderman & Mark Whittingham, Rik Smith , Daisy Brickhill, and Jessica Walkup; Photographs by P.G.H. Evans & J. Reid. Colours of the rings may include (from left to right): red, pink, orange, yellow, dark blue, mauve, light green, white, black, and black & white striped. 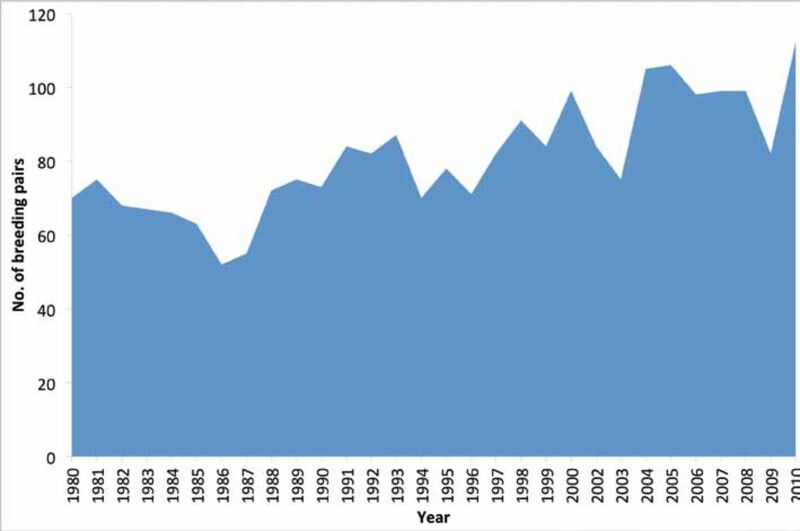 Annual counts of breeding pairs in the Fair Isle core study area, 1980-2010. Most common hatch dates of Starlings on Fair Isle, 1980-2010. Mean clutch sizes of Starlings breeding on Fair Isle, 1980-2010. 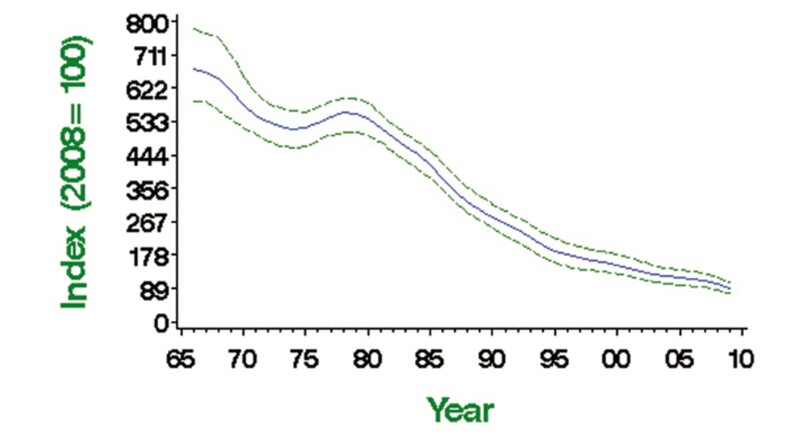 Average annual breeding success of Starlings on Fair Isle, 1980-2010. 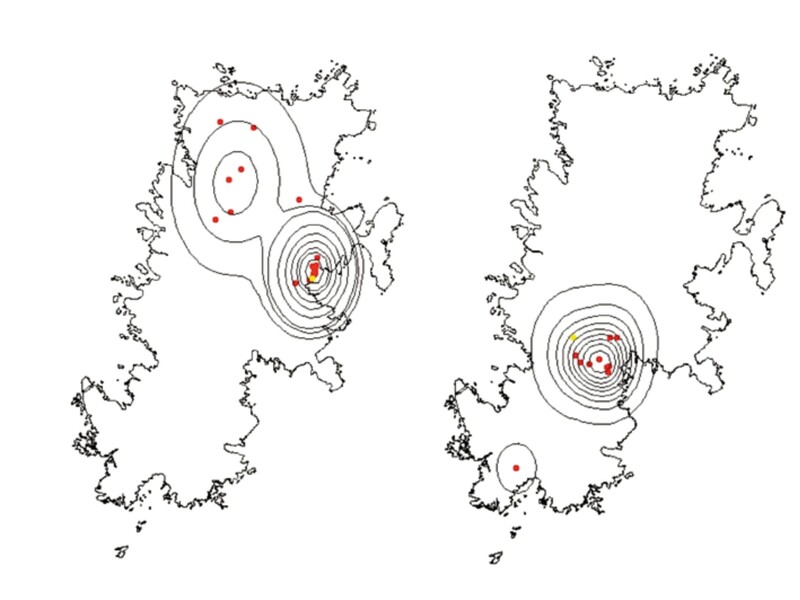 Individual home ranges of two juvenile Starlings in the weeks after fledging as revealed from radio-tracking (courtesy of Jeroen Minderman). 40-year trend in abundance of Starlings in England (British Trust for Ornithology data).